Are you one who wish to type faster on your mobile device, want to answer quickly to your friend’s message you just received or it is that you have a long list of friends waiting for your comment on picture you posted online but you can’t do it faster than certain limit because the qwerty keyboard on your mobile touch device won’t let you type faster than certain limit no matter how fast you are…. ? May be there is something for you , continue reading..
From decades, the only thing which stood firm despite of several changes in the way we do computing is the QWERTY keyboard. Many attempts were made to look for alternative, to find better options but it was QWERTY keyboard layout which is still firm and rock solid. However, with the recent advent of touch keyboards in mobile devices, the need of time is to change and the latest attempt is by Germany’s Max Planck Institute for Informatics. 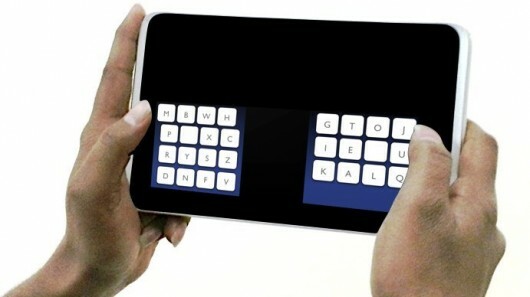 The Germany’s Max Planck Institute for Informatics has developed keyboard layout which is suitable for Thumb Centric Typing on mobile touch device. The new layout is called as [b]KALQ[/b] and has been devised by team led by Antto Oulasvirta using computational optimization techniques along with a model of thumb movement to search through millions of potential layouts. The team finalized about split keyboard layout with 16 keys on the left and 12 keys on the right. The principal of this keyboard layout is that it allows user to move thumb simultaneously without hindering the movement of other thumb which is otherwise not possible in traditional qwerty keyboard layout. As per study done by team, this new layout allows you to type 34% faster than the usual layout and that too only after very short practice on KALQ layout. They have also developed a method for error correction which keep note how thumb moves along with records of statistical knowledge about the text user type using the new layout. Certainly, such findings can help a lot and reduce time user spend on replying and composing messages on devices.